Where Did The Idea For Bootcamp Come From? The idea came about during our team planning last May. We were....gasp....a letter a week crowd. I KNOW! I KNOW! We were tired of still "introducing" a letter in April or May. It didn't work. It doesn't work. And it really doesn't make sense. We decided to try something new. We decided to do all 26 letters in 26 days at the beginning of the year. We decided to call it BOOTCAMP because it was going to be fast and furious! So BOOTCAMP was born out of necessity for us to try something new that we hoped would be better for our students. By introducing the letters/sounds this early we can move our focus to reading and writing words and more! For students who need more help, they get extra help during small groups, one on one instruction and centers! Another benefit of boot camp: EXCITEMENT! The 'staches are excited to come to class. How do we know? Our literacy coach (who has cafeteria breakfast duty) tells us the kids are excited to come up to see what the letter for boot camp will be! Even the hesitant little ones can be coaxed upstairs when asked about boot camp! My 'staches are now talking about the letter for the next day as we leave to go home. It's brought a new excitement to our learning. WAIT...WHAT?! Fun? Excitement!?! Kids are excited about bootcamp?! YES PLEASE! Where's the glitter?! Someone throw some glitter! YES! 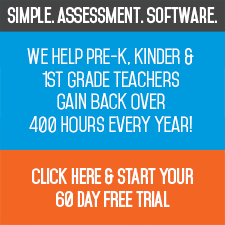 After the first 30 days of school, ¾’s of my ‘staches scored 100% on all the letters and sounds we had learned so far. The 3 who did not are my 2 ELL students and a student with an IEP! They got more than half of the letters and sounds correct so they still knocked it out of the park. The how is pretty simple...nothing big and fancy. Each day of BOOTCAMP we work on a letter. We start with A and we work through the alphabet. The letter is mentioned in the morning message. 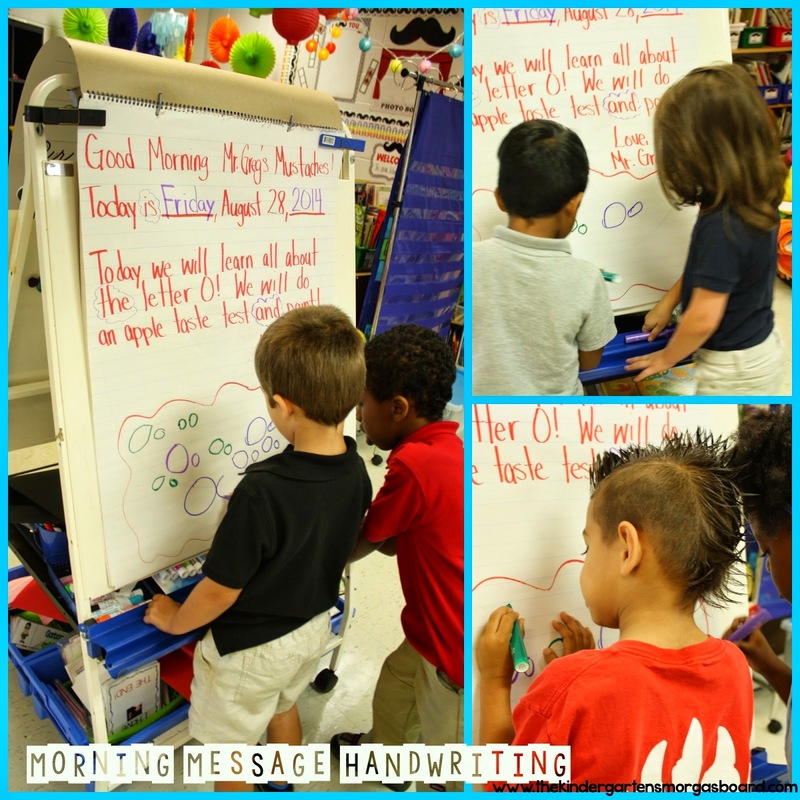 As part of the morning message, I model how to write the uppercase and lowercase letter. Then each child comes to the message and writes the letter (upper and lower case!). During our morning literacy routine, we do a circle map. The circle map features the letter (I made GLITTERY LETTERS!) We brainstorm ideas for words that begin with the sound of the letter. WE DO NOT INCLUDE VOWEL SOUNDS at this time. If a student suggests a word with the vowel sound, we talk about how the letter makes that vowel sound....and we say we will remember it when we come back to the vowel sounds! 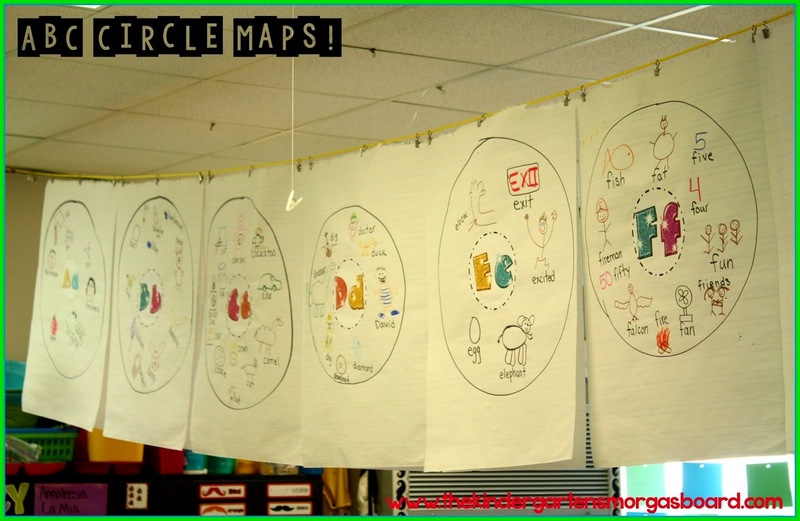 The circle maps are being displayed on our anchor chart rope. When we finish all 26 letters, I am going to take a picture of each circle map, have it printed in an 8x10 photograph at Walgreens. Then laminated and bound into a book! Do we use centers? You bet we do! Our "ticket to centers" is handwriting. Each child gets a handwriting page and practices writing the letters. One of the highlights of ABC BOOTCAMP is our silly hats. For each letter we make a silly hat. Everyone makes each hat, including me! In fact, you might walk in and find me laying on the floor making my hat with the 'staches. Some days I have my hat prepared ahead of time as a model, but I really like to get down on the floor and work with them. THEY LOVE THAT! We usually have 15-20 minutes for the hat. If your hat isn't finished before time, it goes home. No excuses! We make the hats in the morning, usually right before lunch. We wear them all day! However, we do have some rules for hats! Rule 1: on your head or in the trash! We don't play with them and if they're a distraction they get trashed. Rule 2: We do not wear them to lunch, recess or specials. This is just to avoid issues! Another benefit to the hats….I can pull a child or a small group while the others are hard at work on a hat. We do this to re-inforce the sound and have some fun. 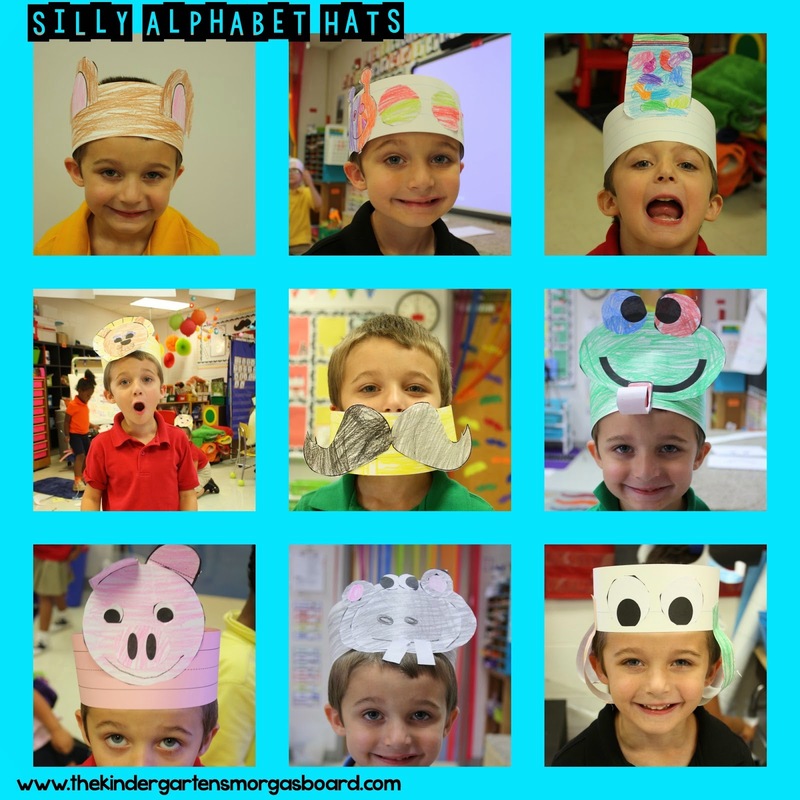 The hats are great for cutting and gluing practice, following directions and fine motor skills! It also reinforces the letter sound of the day in a fun, meaningful way! And they're silly and fun. We get lots of giggles from the hats! The 'staches love to look up and see me wearing my hat. They're also great for getting other adults involved. Every day at t dismissal, our gym teacher asks my 'staches about their hats! They're recalling the sound and letter and explaining why we did a certain hat. People, the hats are EPIC fun! My 'staches love them. I love them. We wear our hats proudly all day! And yes, I make a hat and wear it proudly! I have been asked if this is the only time we will learn the letter and sound....NO! We review every letter and sound every day during our morning literacy routine! We use letter/sound chart every. day. of. the. year. BOOTCAMP is just introducing the letters....it's not the only time we see the letter and work on the sound! 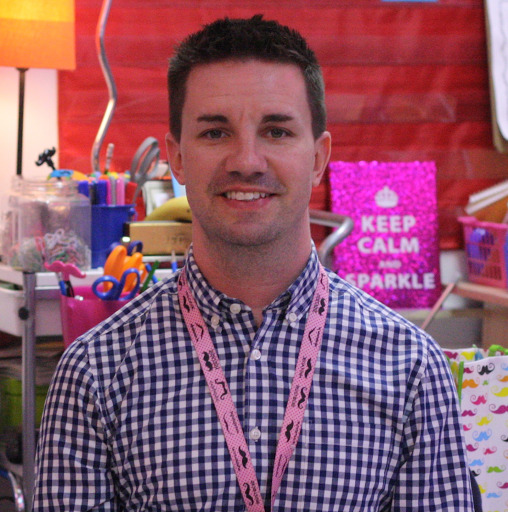 Our guest blogger is Mr. Greg Smedley-Warren from The Kindergarten Smorgasboard. The post Greg shared with ESGI today is one of his most popular posts from earlier in the school year, and worthy of a re-run. We hope you enjoy it!